Gently heat a couple of tablespoons of oil in a medium sized pan or saucepan. Add the onion and garlic and cook until the onion becomes translucent. Add the bacon and cook for a couple of minutes. Add the chilli flakes and cook until the bacon begins to brown. Add the tomatoes and water and bring to the boil. Reduce the heat to simmer and allow the sauce to bubble away until it reduces to a thick, tomatoey sauce. Meanwhile cook your pasta according to packet directions. Make sure you don’t over-cook your pasta. 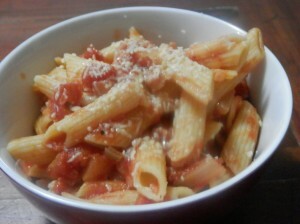 After you have drained the pasta, add it to the tomato sauce along with the parmesan cheese and stir to combine. Serve immediately, sprinkled with more parmesan if you like.